Sucre – Hostels in Sucre. 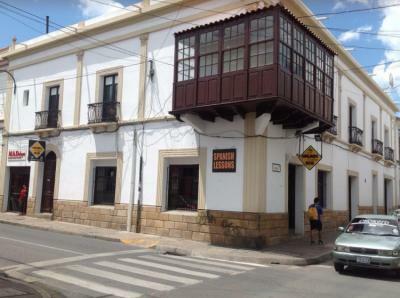 Maps of Sucre, Photos and Reviews for each hostel in Sucre. Looking for a hostel in Sucre? Look no further, all the good deals in Sucre are on Dorms.com. Like thousands of other people every month, book your hostel securely at the best price in all neighbourhoods of Sucre. On this site, you can easily find a hostel downtown, in a trendy neighbourhood; a hostel in the student- university district, close to bus or train stations, airports or major attractions of Sucre. Our colorful colonial House is right in the heart of the city and is quiet, comfortable and spacious. When arriving in Sucre you will enjoy the beautiful white-washed colonial architecture. The city is surrounded by mountains, with a year round spring-like climate. While in Sucre you have the opportunity to spend time in many coffe shop and restaurants, stroll through the plaza or enjoy a walk at Parque Bolívar.